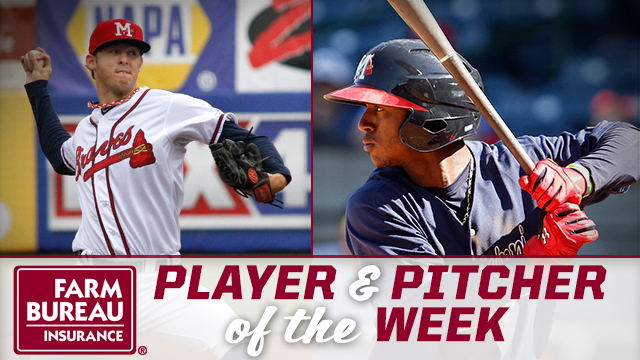 PEARL, MS-Recently promoted shortstop Ozzie Albies and M-Braves RHP Brandon Barker have been named Mississippi Farm Bureau Player and Pitcher of the Week for the week ending Sunday, May 1. The 19-year-old Albies was promoted to Triple-A Gwinnett Saturday. He ranks as the Braves No. 6 prospect and sits at No. 63 among Baseball America's Top 100. For the week of April 25 through May 1, Albies posted a .500 batting average and an .813 slugging percentage in four games. Tagged the "Best Infield Arm" among Braves minor leaguers, the Curacao native was hitting .369 with eight extra-base hits and seven RBI through 22 games with the Double-A Braves. Among Southern League leaders at the time, Albies ranked second in average, tied for first in total bases (43), second in hits (31), third in OBP (.442) and fourth in at-bats (84). He was signed by the Braves as a non-drafted free agent on July 2, 2013. Barker made one start during the week, tossing six shutout innings and allowing just two hits while walking one and striking out four against Biloxi on April 26. In five games, four starts, for the M-Braves this season, Barker is 2-0 with a 0.78 ERA. He allowed just two earned runs and is holding opponents to a .222 batting average. Last season with the Braves, Barker led all farmhands in wins (12) and strikeouts (109) and was named Organizational Pitcher of the Year at High-A Carolina. He was selected by the Braves in the 16th round of the 2014 draft out of Mercer University. The Double-A Braves are currently on a 10-game road trip to Jacksonville and Tennessee. The Braves conclude the first five games tonight against the Suns before taking a day off to travel to Kodak for five games against the Smokies. Mississippi returns to Trustmark Park May 9-13.